Felon in Possession of a Firearm You need an aggressive Criminal Defense Attorney! Food Stamp Fraud Charge Being Investigated by the State? Attempted Possession of a Controlled Substance Did you get caught in the act trying to score? ☆ Call an Experienced Milwaukee Criminal Defense Lawyer Before Jeopardizing Your Freedom! If you have been contacted by the authorities or charged with a crime, you need an aggressive, respected Milwaukee Criminal Defense Lawyer. I have a long track record of successfully representing individuals accused of crimes in Milwaukee Wisconsin. From successfully challenging unconstitutional police action to winning "NOT GUILTY" verdicts from juries, I use all resources available to ensure my clients get the very best defense. If you have been suspected of committing a crime, you need the advice of an experienced Milwaukee Criminal Lawyer Now. If the authorities are questioning you about a crime, the 4 most important words you can say to them are, "I WANT A LAWYER." Do not give any type of statement to the authorities without the advice of counsel. If you have already been charged with a crime, then you need a Milwaukee Criminal Defense Lawyer with a track record of success and the sooner the better. The options available to you decrease as each day passes. 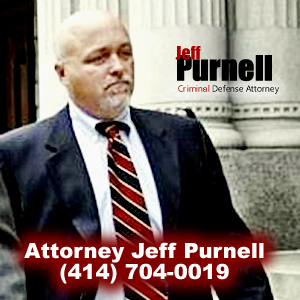 Attorney Jeff Purnell is a Milwaukee criminal defense attorney. He has been representing people accused of violating Wisconsin criminal laws for over 17 years. Criminal Defense Attorney Purnell takes both State and Federal criminal cases throughout the State of Wisconsin. Purnell Law Office clients have included Professional Athletes, Politicians, Police Officers, and other Attorneys. Milwaukee Criminal Defense Attorney Purnell defends Drug charges, OWI, Gun possession, and Sexual assault charges Criminal Defense Attorney Purnell has won Not Guilty verdicts in some of the most high-profile jury trials held in Milwaukee criminal courts in years. In fact one major victory was covered by CourtTV. He has also won cases by attacking the means by which police have obtained evidence against my client. He stays up to date on the current status of Wisconsin criminal laws, and makes sure Purnell Law Office clients get the most complete and aggressive defense possible. He has defended people, both adults and juveniles, accused of possession of marijuana, cocaine, and heroin, as well as OWI, battery, felon in possession of a firearm, public corruption, and sexual assault When you hire attorney Purnell your case gets the complete attention of an experienced Milwaukee criminal defense attorney, and not a legal assistant or secretary. Milwaukee Criminal Defense Attorney Purnell will personally analyze the evidence against you and give you a frank analysis of the strengths and weaknesses of your case. Call or email Milwaukee criminal defense attorney Jeff Purnell for a no-cost discussion about your Wisconsin criminal case. At Purnell Law Office, fees are broken down into a pre-trial component and, if necessary, a trial fee. You only pay for the services you need. Call or email attorney Jeff Purnell for a no-cost discussion about your Wisconsin criminal case. At Purnell Law Office, fees are broken down into a pre-trial component and, if necessary, a trial fee. You only pay for the service you need. ©2019 Purnell Law Office - Criminal Defense Attorney in Milwaukee, WI. - All Rights Reserved! Have you or a family member been arrested?